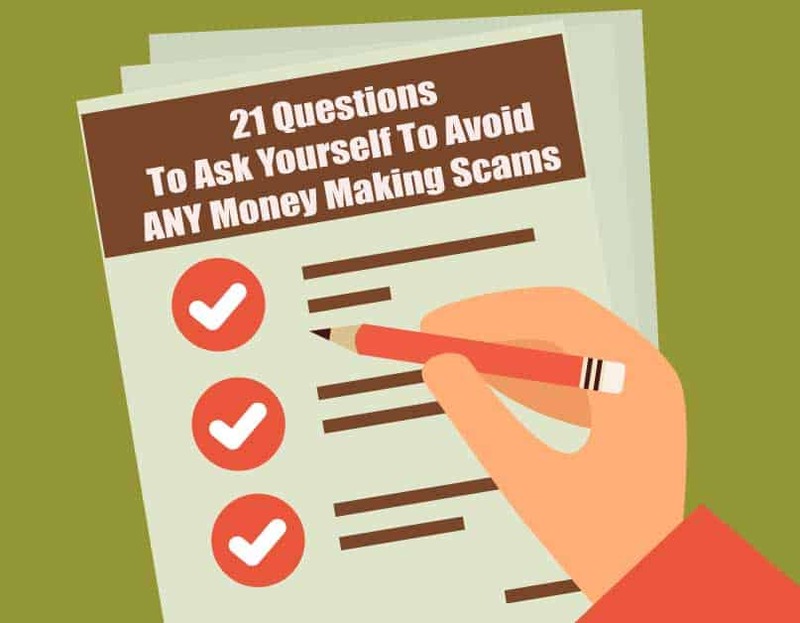 That is why I created this check list you can go through to help you identify whether an online money making opportunity is legit, or a big fat scam. I personally go through these points as well when evaluating the scams that I post in my product reviews as well. If you are ever doubtful of whether something is a scam, go through this check list and you would most likely have your answer. You just landed on the website at this point of time. Ask yourself these 7 questions as you should be able to answer them after being exposed to the money making product for 5 minutes. 1. Does the website look legitimate on first glance? Most scams such as Real Translator Jobs usually have a well designed web site at first glance. It looks very professionally and well done as well in my opinion. However, what do you think about the message that it is bringing across? Does my gut feeling say that this website is safe and scam free? Does the website look credible? 2. Does the website have a lot of advertisements? 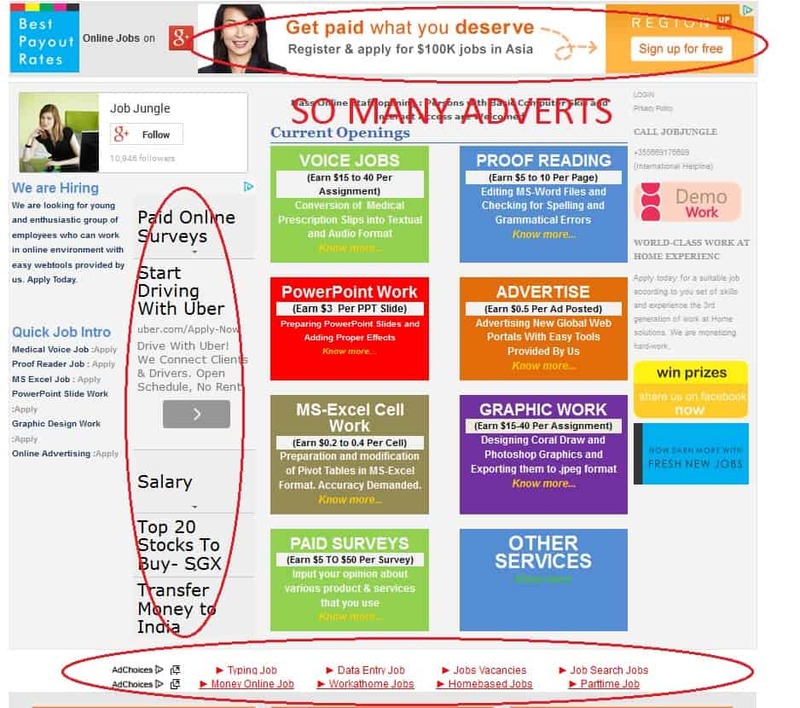 Some scams that promote money making opportunities such as Job Jungle is riddled with adverts like the picture shown. I’m very sure you should know that legit businesses don’t even have advertisements at all. Even if they do, advertisements are only kept at a corner or at the side bar so it doesn’t affect their main business. If there is advertisement, what kind is it? Does it link back to their website or external websites? 3. Does the website promises you quick cash such as ‘$2000 in the next 24 hours’? This is an easy one: If the website promises you quick cash in a short duration, it is usually a scam. I have not seen any money making product that has the ability to help people make quick cash in a short amount of time, or a ‘set up and forget’ software that generate passive income. If you do, let me know. Does it promises to make me money immediately? 4. Do you need to pay immediately for the opportunity? If you ever need to pay for a product, make sure it isn’t a work-at-home opportunity. Any website that offer you jobs and ask you to pay a membership fee are usually a huge scam. Any legit work-at-home opportunity usually comes free, such as microworkers. The rule of thumb is: Don’t pay if you do not know what you are doing to earn the money. Also, never wire funds over. 5. Is the offer TODAY only? If you noticed the image in point 4, you would see that the offer was ‘VALID TODAY ONLY’. The question is, is it REALLY valid today only? Most scams try to get you to quickly sign up to make you perceive that if you miss out on the offer today, you are missing out on the greatest opportunity or the best thing that could ever happen to you. They play on that fear, and get you to spend your money quickly. Don’t let these scams control you. Tip: Change your computer clock to a future date like what I did in the image above to see if the date changes. If it does, it’s a scam. 6. Does it try to hype and bait you? One thing scams like to do is dangle huge houses, sports cars, huge earning potential in your face for the first few minutes after you encounter the scam. It does not in any way explain their program but keep filling you in with how much their members and themselves earned, personal stories including success stories and how life changing it has been since they used the program. If you’re still going ‘what is this all about’ after watching the 10-20 minutes video because you aren’t sure how to earn money from it, you got a hype and bait video in front of you. I’m not saying they’re all scams, but most of them are. Do I know what the program requires you to do to earn money at the end of the video? Can I really attain everything in the video/picture after joining the program? 7. Are they using real images? The question here is: Are they using real images, or just a bunch of stock images or videos? I did a review on profit booster app and I realized the whole video was stock pictures and videos. 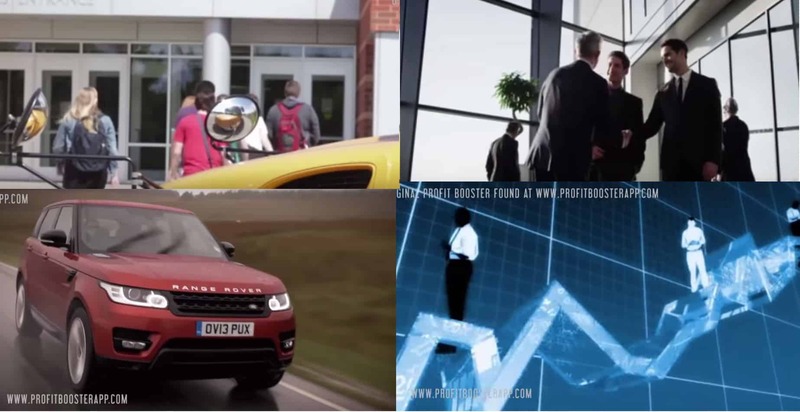 If a scam is using stock images, would you trust them? The actors on the top right hand were supposed to show the founders of the scam product, but it is obviously fake (and a stock photo) if you take a closer look. Did you know that even actors that act as the creator or owner of a product could be hired to make such videos as well? Do the founder(s) of the money making product show their face at all? After the first 5 minutes, it is time to go more in depth and look around the website to check for any more details that could if the money making opportunity is legit or a blatant scam. These next 14 points should help you gather more information and make a more informed decision whether you should continue or not. Likewise, a Terms and condition is usually included to protect the website and business. It is usually for legal reasons, and is fairly long to protect every aspect of a business. Any proper and legal business would definitely have one, maybe including a disclaimer like my website. Note that if any program that you chance upon lack these two documents, it is most likely a scam. However, if these two documents are included, you still cannot rule it out as ‘not a scam’. Is there a Terms and Condition? Is there any earnings disclaimer? 9. Does the company have any contact details? Any legit business or program usually would have some way for users to reach out to them. If a business does not list ANY contact details or office details, something is definitely suspicious. It may be because that they do not want the users to ever find them (because they’re running a scam). Is there a physical company location located on the website? Do they list any Email address for help included? Are there any phone numbers that you can call? Any contact forms included in the website for you to contact them? Easiest way to check out if they are legit or still running is whether they reply you. Simply craft an Email asking them about the opportunities on how you can earn money inside the program and see if you get any response. Some scams have been up for years, but has virtually no one sitting behind the desk to answer any questions at all. If they don’t reply, how do you think you are going to get support when you’re in their program if you ever need help? If there’s a reply, take a look at how they answer your question. Above is an example of one of the scam sites I reviewed, Earnparttimejobs, a website that promises data entry jobs. My question was simply ‘How do I make money?’. For a website that promotes data entry work, there was no mention of such thing at all, just referring people to earn money. Is there any reply after contacting them? Many money making programs usually feature testimonials of users who have used the program to earn money. How do you know if it is real or just something spun up by the website to make the program look legitimate? Check out this review by Profit Booster App featuring Mary and Shane. 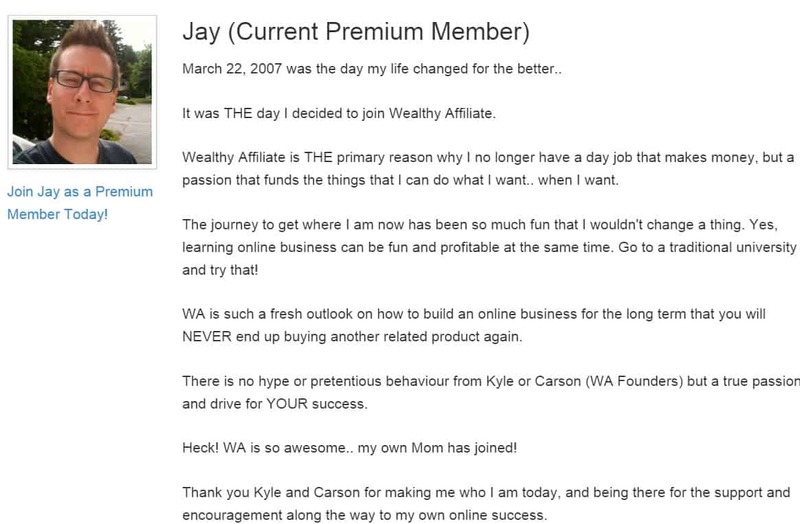 How about this review by Jay on Wealthy Affiliate? Which one are you more inclined to believe to be real? For me, the review by Jay seems more believable than both Mary and Shane. The reason is because the review by Mary and Shane seem very generic and fake to me, while Jay’s story seem more personal and more like a real review. So how do you know if a review is fake? One way is to check out a tool by Cornell University called Reviewskeptic which was made for checking whether a travel review was real or fake. This tool identifies keywords to find out if a review is real or fake, and can be used in this case too. Check it out right here. Can I find the same review on another website? 12. Are they really featured? There are many programs out there that claim to have been featured by prominent news sites such as CNN, BBC, and more. But in actual fact, how do you know if what they are saying is even true? 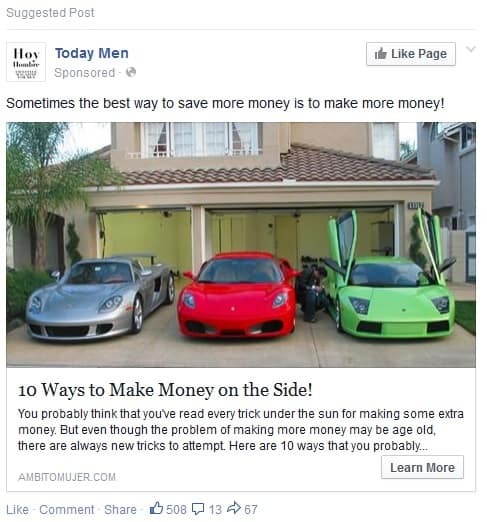 An example of what I am talking about is taken from Facebook Millionaire. If you noticed, they claim to be ‘seen on’ various prominent news websites. Most of the time, you should realize that scam websites do this to convince users that they are a legit program. Surely a program that has been mentioned by CNN has to be credible, right? Wrong. That is because most of them are faking it. The best way to find out is actually going to the site that claims to feature them, and manually search for the program. For example, I would go to CNN and BBC to search for Facebook Millionaire to see if there’s actually an article on the program. If there isn’t any mentions of the program at all, you know you have a scam on hand. Can I find the article that talks about the program on the featured site? 13. Do they try to steal your trust? Most scams try to relate to you that they are accepting people from YOUR country, and display your country flag somewhere on the website. They want you to think that you are the ‘lucky people’ to be in the country that can access the program. It is really easy to change the flags to where the user is accessing the content is from, as the website tracks where your IP is from. Since I’m from Singapore, websites would display the Singapore flag. When I used a VPN to change my IP address, it would change the flag to that respective country. If you noticed the picture above, there are these buttons with the Web Guard words that show how a website is ‘security verified’ or ‘privacy verified’. This is also another feature to trick you into gaining your trust. On a legit website, what this actually does is that it helps protect the website from viruses. It also provide users with information about the business (such as contact details or address) if they want to see it. In order to access these information, users can click these buttons. If you can’t click the buttons, that means the website is not protected or covered by these security program. Which usually most likely means the program is also a scam since they are trying to trick you. 14. Are they really ‘risk-free’ or have a ‘money-back guarantee’? While we’re on the topic of tricking you into gaining your trust, the company usually love to follow up with a money back guarantee. 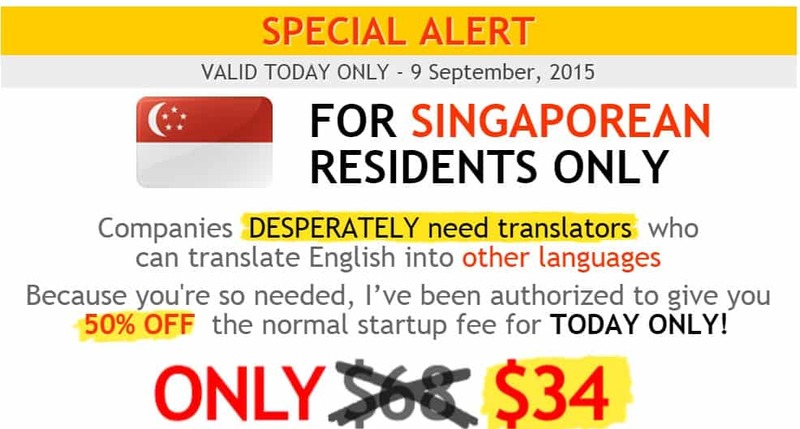 The picture above shows a money back guarantee from real translator jobs. One thing I have learned from all these scams: Don’t be fooled by a guarantee. Scam companies usually NEVER honor their money back guarantee. I could always just put a money back guarantee on the website to trick you into thinking that it is a safe choice by paying, as you could always get your money back if it doesn’t work out well. And when it really doesn’t work out, you aren’t going to get your money back 99% of the time. They have already successfully gotten your money and couldn’t care less about helping you with anything else. 15. Is the date of website updated? It is very easily to spot out a website that isn’t updated. Check out their footer for the date of the website, as some money making scams may not even bother updating the date to the latest year. This is the easiest way to see if a program is outdated (even for legit programs) and do not even bother updating to the latest year on their website. For example, you can check that even my website is updated to the latest year on the bottom right hand on the footer. This is because I still update on a regular basis. Some scam websites still make money despite not updating the website promoting the scam for years as people do not check this simple detail. 16. How do you really earn from it? Similarly, some programs recommend you to sell their product to friends and families to earn more commission, which is really a diversion from the main product you wanted to buy in the first place. Work at home programs like Real Translator Jobs and Gaming Jobs Online have affiliate programs that let you earn a commission when you refer a friend, which are why some people are promoting such programs even if they know that the product is completely useless. To be honest, if you really wanted to learn how to sell products, I would recommend Wealthy Affiliate that teaches you how to do it legit and ethically, to sell REAL products instead of promoting scams like this. Do I earn from the program the way the program claims to? Do I earn from doing the jobs/tasks that they provide? How much do I earn from it? 17. Do they ask too much? This is usually a dead give away. Legit websites usually would want your name, username and email at the most in order to sign up. So if the program wants important/sensitive information such as your social security, marital status or bank account when you sign up, definitely be suspicious. There’s absolutely no reason for them to have such details when they don’t even need it in the first place, except trying to scam you! Most of the time if you are working on a legit website and program, you will be paid directly. For example, if you are freelancing at Fiverr or Microworkers, you are paid by the website directly as they are the middle man that connects the buyers and sellers. You are also paid by per job, and the amount you earn depends on how much you work. a. Does the program pay you a salary or by commission? b. Who is going to pay you – The company, or externally from people? c. How and when are you getting paid – Daily, weekly, monthly? For scams, they usually avoid this question altogether. They would give a really vague answer or even ignore your question altogether as they have no intention in paying you at all. The most important thing is to ALWAYS read the fine print. This is especially if a program gives a free trial sign up, or require you to pay a small sum to ‘try’ the program. This usually involve giving your credit card details and your information. Most people ignore the fine print because the font size is really small. However, never ignore it as scam programs love to overbill you here. 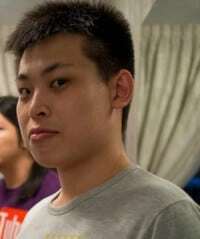 For example, Facebook Millionaire’s sign up cost is actually just S$5, after which you are billed S$110 per month. Such sneaky tactics can easily show you that the program is trying to cheat as much money out of its users as possible. This cost is only stated on the fine print and not on any part of the website at all, and technically you agreed to be billed this much as you usually agree to such clause if you choose to pay. The thing is: what makes you so sure that you can cancel your billing anytime? Some people that signed up for Facebook Millionaire claimed to have difficulties cancelling their subscription. This is why you should NEVER hastily sign up for a program if it requires a credit card. Have you ever encountered this when you try to close the browser tab of the program? The above screenshot is taken from the Real Translator Jobs website. Apparently after closing the first time, I was presented with a cheaper offer. After a 2nd time, an even cheaper offer. They like to make it sound like it is a once-in-a-life-time deal, but actually present it to everyone who have been on the website. The reason is that they just want your money, regardless of the amount. If you noticed the screenshot in point 16, that is what the down sale is all about, making the offer cheaper until people consider it cheap and spend money on their program. That is their main aim, which is getting people to buy their program. Most scams are usually work like that. If they manage to even squeeze out a dollar of you, they are already successful. Beware of such traps of cheaper deals being exclusive because they just offer it to everyone. Most scams that I know tend to use this technique to capture ‘loss’ sales. Are there any pop ups when I try to exit? How many do I need to close before it really closes? This is the most important point. There are probably many users such as yourself who are wondering whether to join a program, or have already joined the program before. As such, you should search the reviews of these users through Google, Yahoo, Bing, or your favourite search engine. These would usually show you results of review sites such as mine that critique each program to see if they are actually a legit money main program. However, you need to be careful to avoid fake review sites that are set up by the scams to trick users. The comments seem to all agree that the product works. As a result, check a few review websites to see what the overall consensus and draw your own conclusion from it. If 9 sites does not recommend a program while 1 does, you should know to avoid the program. My websites is designed to expose these scams, but I can’t possible review every scam out there myself. I have compiled a few websites for each category so that you can refer to these websites for a certain category. Scam.com – Forum that covers literally every scam in the world including money making scams. Search the forum to see other users experience. Scams Subreddit – Reddit is usually a great place to check out scams too. This one is dedicated to scams. Ripoff Report – Has a really big data base of scams. This website has input from users to report the latest and most up to date scams too. MLM Watchdog – One of the oldest sites in the internet exposing MLM scams, thus the ‘old school’ design. Binaryoptionschannel – Great place for Binary Options. Also to check out Binary Option scams and where to find legit Binary Options. ForexFraud – Check out legit programs, and also avoid some of the scams that they listed here. They have a lot of articles on Forex, Binary Options, and things for beginners too. Investopedia – Great resource for financial things. This article talks about how to avoid a Forex scam. Scam Xposer – They cover A LOT of scams, and legit opportunity at the same time as well. Most of it are based on Money making or Work at home systems, so you can be sure to find a program on this website. We can all agree that the Internet is a dangerous place with all these scams out there. Therefore, it is really important to equip yourself with the necessary skills in order to protect yourself. I created this check list as an way to check if a certain money making program is a scam. All you need to do is go through this check list and ask yourself these 19 points and you can guarantee yourself of an answer whether a program is legit, or if you should totally avoid it. A scam will most likely fail quite a lot of points listed in this check list as they seem to rinse and repeat the same methods as they are still pretty effective in convincing people. I know that if you have read this far, you are tired of scams. As a result, I recommend you to check out my side income page where I introduce some apps or websites that can help you make a few dollars a day by using them. 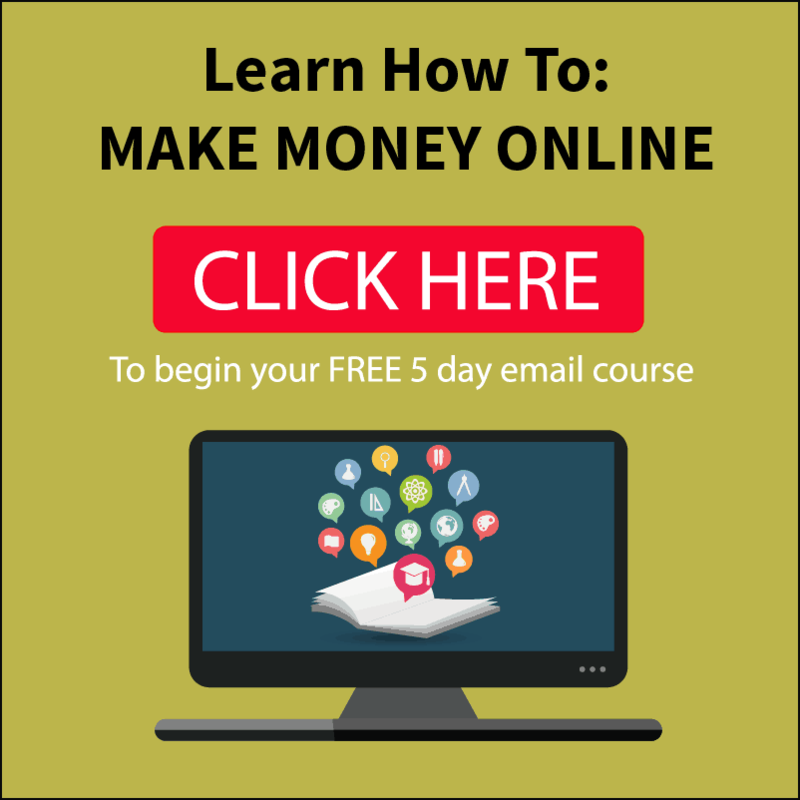 Alternatively, I provide a free 5 day email course to teach newbies how to make money online. Check out the banner below, or the review of my #1 recommended product to make your first dollar today!! Have this check list help you avoid a potential scam? Share with me your comment below! Thanks for the information, I myself have meet up with so many scam sites, but except i perceive that i needed a program or product the site is promoting, i don’t sign up for a program. I agree about PTCs that most are consistantly paying, but there are still some scams out there (or eventual scams when they can’t pay out anymore). In short, people just need to be cautious before joining any money making opportunities online by following these questions I outlined on this website.